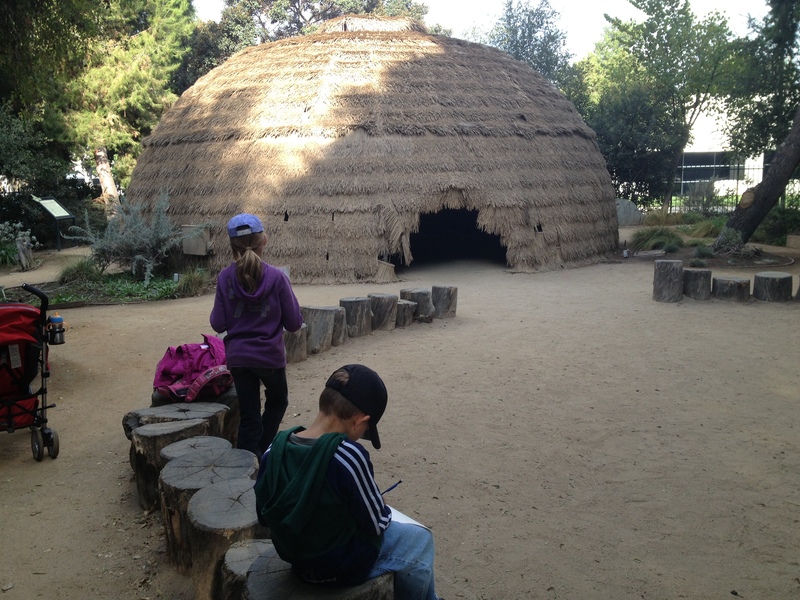 For our first trip, we focused on the Native American group in the area (Tongva) and exploration by the Spanish, by means of the LA River and Arroyo Seco. This lesson plan can also be used for any area, you’d just have to find the locations, but the basic premise would fit in easily. One of my goals in doing this is to try and get my mind away from how to educate the masses and how to guide learning for a few kids. It was challenging to come up with something, but then also make sure I wasn’t pushing them to do things that would take away from the experience. I felt like I needed a purpose while we were doing this, so I came up with a pretend mission from the Spanish king. Food to eat along the way: Through exploration there was an exchange of goods — popcorn (brought to Europe), dried apricot (brought by the Spanish), and chocolate (brought to Europe). Took us 4 hours and 45 minutes, but I was rushing them sometimes. I had to stay on schedule so I could get my daughter back for her nap. So, could easily have spent more time. This is a free park. LA Arboretum is free on the third Tuesday of the month. 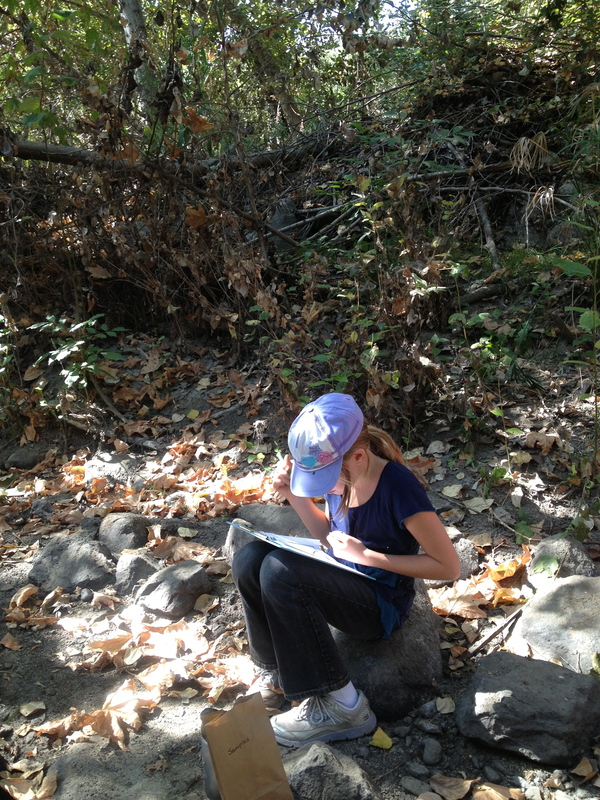 Described the wildlife and plants (choose one animal and one plant to do a quick sketch and describe)…if interested they could tally marks on laminated bird, plant and animal laminated pages (they weren’t really…but we were able to find some of the birds which was great). 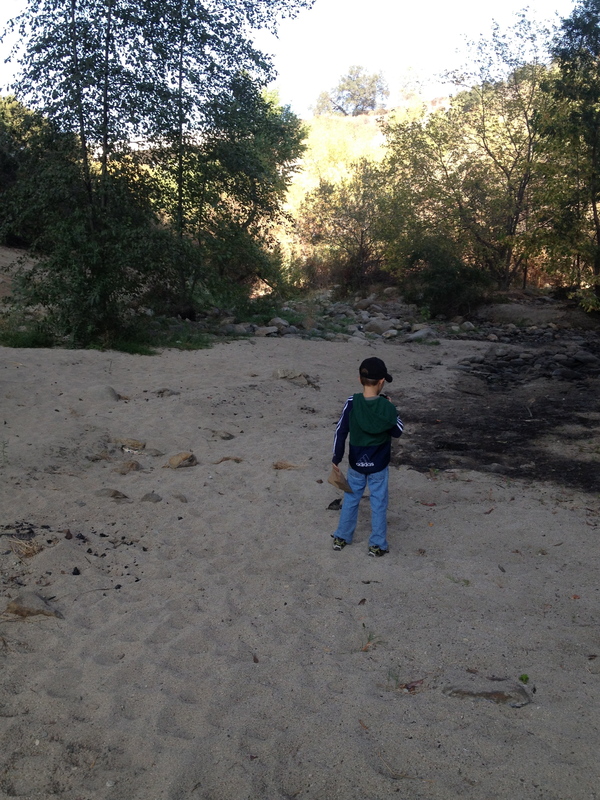 North of the golf course, walk along river there…paused to draw a map of the “river” they see — there was no water. It was early Fall, but also a good chance to bring up the drought. 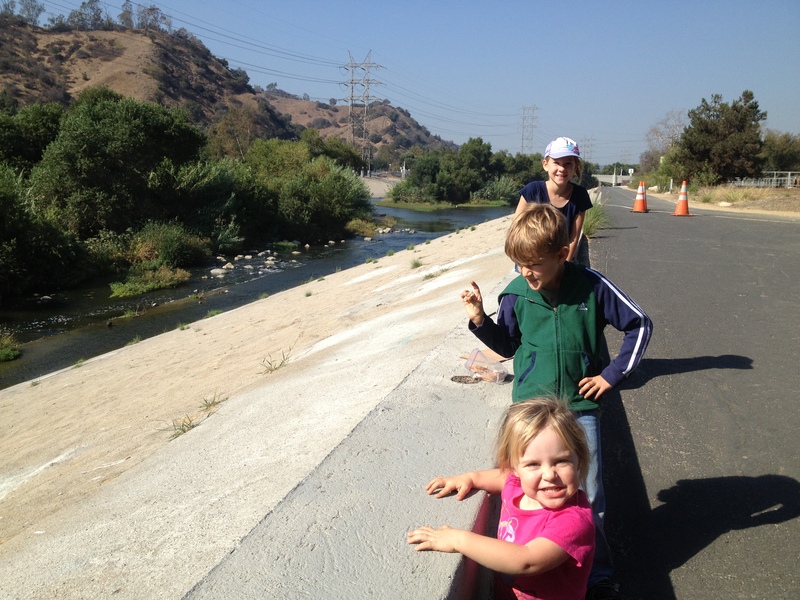 On the way, pointed out the concrete channel, noticed the difference between the two sections of the river. Handed out bags before going into the brush for them to collect samples. 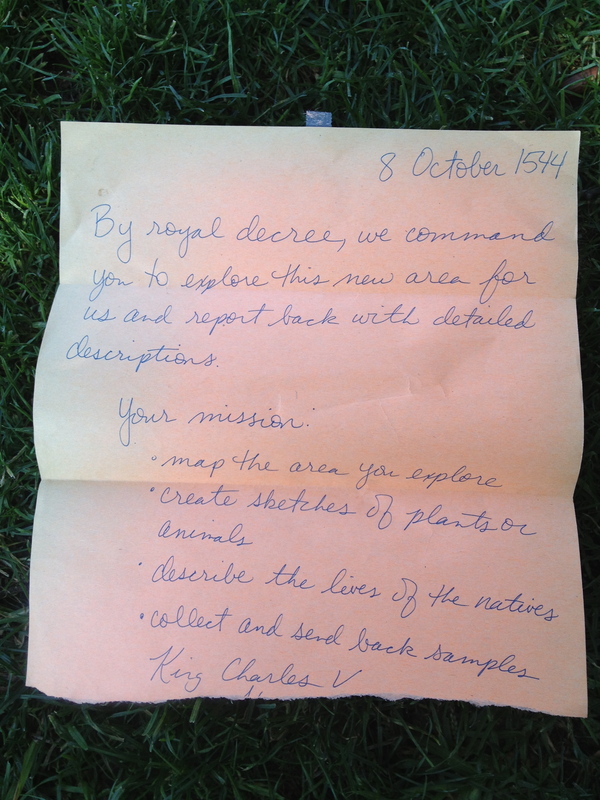 Explore (look at the watershed again) and add another quick description of an unpopulated area, picnic with the king. Tell king what they think about the area and share items collected. American Indians have been living in the area for over 8,000 years. Exploration by the Spanish was mid 1500’s. It wasn’t until after Mission San Gabriel was built in 1771 that natives were exposed to the Spanish. They converted to Christianity (some willingly, but many forced). Before this, they were polytheistic. The main god was Chinigchinix. Currently there are about 1700 people who identify themselves as members of the Tongva or Gabrielino tribe. The Hahamog’na, are a tribe of the Tongva People of California. Hahamog’na was the name of the tribe’s chief. The tribe’s name and the place in which they live also take his name. Hahamog’na was met by Gaspar de Portolà of the overland Mexican Expedition in 1770. When he converted to Christianity, Hahamog-na was given the name “Pascual” and his tribe became known as the Pascualite Indians. This name preceded the naming of Rancho San Pascual, part of present day Pasadena, San Marino, and South Pasadena,. How long would it have taken us, if we were on horseback—just the traveling part! By royal decree, we command you to explore this new area for us and report back.